In the midst of a summer storm, seventeen-year-old Jocelyn Lennox swerves to miss a strange creature in the road. The resulting accident leaves her mother in a coma with doctors skeptical about her recovery. Desperate for answers, Jocelyn returns to the scene of the accident to discover that the creature was one of the good folk—a faerie. Not only that, but the queen of Faerie herself is willing to listen to Jocelyn’s story and offer her help. I wasn’t sure what to expect when I opened this book on my kindle for the first time. I was really looking forward to reading a fantasy (as I haven’t in the last weeks), but I was immediately intrigued by the world that Jocelyn had allowed herself to get caught up in. Jocelyn is a typical seventeen-year-old who experiences immense guilt on a daily basis for the situation her family has been thrust into. 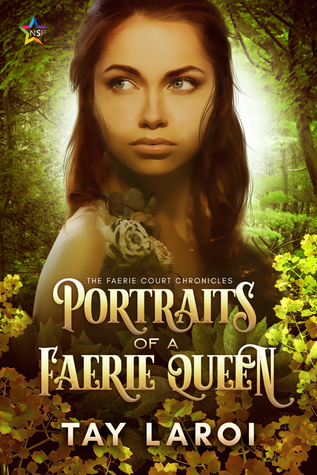 She takes this burden on her own shoulders and begins to fight for her mothers’ health by getting involved with the Faerie Queen and striking up a deal (pretty bold for a seventeen year old). As I read, I was impressed with Jocelyn’s growth, but often annoyed at how independent she felt she had to be in all the situations that were presented to her. I understand this was part of her character and she didn’t want anyone else affected by her actions, however the constant wave of support she received from those around her should have implied she was not facing any of this alone. Reading the summary of this book (which was all I did), I was not aware this was a diverse read but upon reading it, I definitely felt that the relationships were authentic and it didn’t take away from the story at all. This was a really empowering book for lesbian relationships and I was really happy to see such diversity in a fantasy novel. As far as the other characters go, I almost felt more connected with them than I did with Jocelyn. I felt as though she allowed her weaknesses to show quite often, but almost as often she was incredibly strong (no spoilers, there was a moment where she produced an entire plan at a moments notice that she should have had no knowledge how – at least not to the level she dictated). I still felt she was a stranger at the end of it, but perhaps that’s because we were able to see all the other characters in their own worlds (Rina at school, Anna at home, Mr. Hob at the bookshop, etc), whereas Jocelyn was never able to be herself the entire book. She was always trying to be something to somebody and never had a moment to breathe. So I can see why – I just wanted a few moments with Jocelyn to learn more about her. The descriptions throughout the story were absolutely stunning and I was so impressed with the dialogue as well – authentic with hardly any awkward phrases, even some jokes thrown in that made me crack a smile. I was truly pleasantly surprised by the character interactions and how lifelike it made them appear. I’ll be honest, I’m not big on fairys (or faeries) and I never have been but this is the best ‘faerie’tale I’ve ever read. This was full of action and love and family but more than that, it was something that was hard to put down. I consistently wanted to keep reading to find out what was going to happen to the characters and what the big plan was all along. I was really really pleased with this story and I’m very excited for the sequel to be released sometime in the near future. I definitely recommend grabbing a copy! This was a great, beautifully written fantasy read!